Looking for an easy way to specialize the tab behavior in Firefox? With the Tab Kit extension, you can personalize the tab experience to suit your heart’s desires. Once you have installed the extension and restarted your browser, you will see the following window before Firefox itself will finish loading. You will need to decide which Tab Bar layout best suits your needs. Notice that you have the option to continue using the default Tab Bar layout in Firefox. Once Firefox has finished loading, it is time to have a good look at the options that are available with Tab Kit. 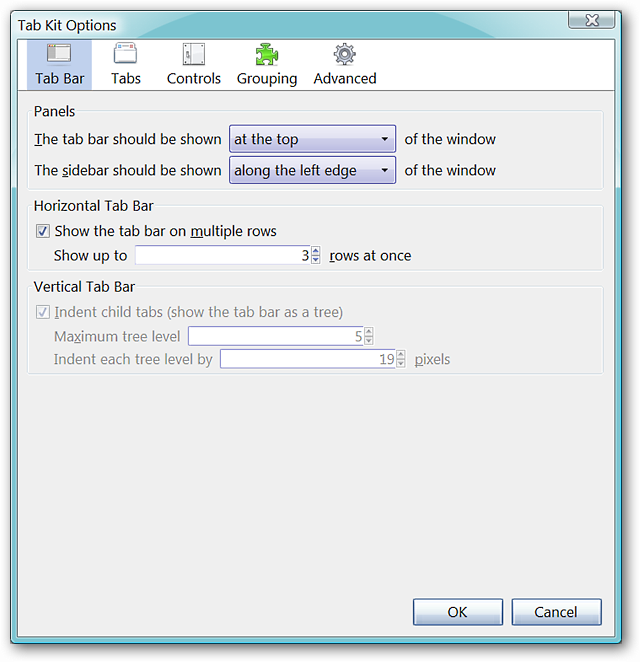 In the Tab Bar Window, you can select the browser window positioning for the Tab Bar as well as the Sidebar (i.e. Left, Right, Top, Bottom). If you choose to use the “Multi-row Tabs” layout, you can select the maximum number of rows that will be able to display (wonderful!). For those who choose the “Tree Tabs” layout, you can select for indentation of child tabs, maximum tree level, and the amount of indentation for each tree level. Choice is good! 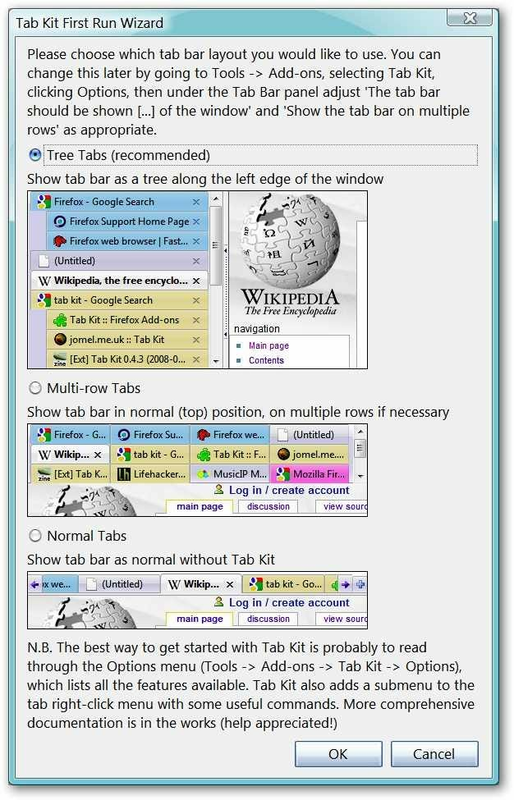 In the Tabs Window, you can specify minimum tab width, use or non-use of close buttons on tabs, tab appearance (i.e. 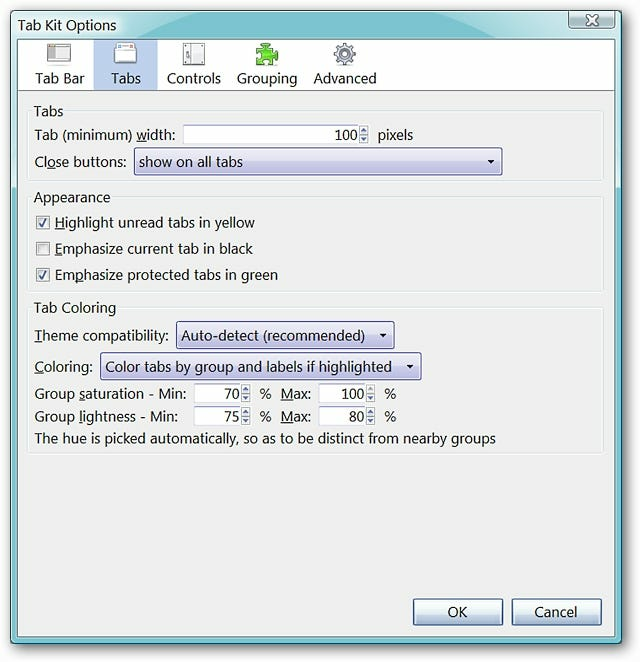 highlighting or emphasis), and tab coloration (i.e. grouping and saturation). Note: For our example browser, the Close Button did not display on the last open tab. In the Controls Window, there are options regarding mouse gestures, tab dragging, scrolling, and opening selected links. In the Grouping Window, you can choose grouping behavior for tabs, positioning for ungrouped tabs (definitely a terrific option! 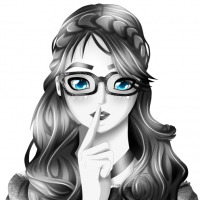 ), and the actions to be taken when closing tabs. In the Advanced Window, you can choose to have tabs open from a specific area (i.e. the Address or Search Bars), tab closing options, tab order, and more specialized behavior for tabs based on the opening source. Notice that you can also reset all options to their original defaults (very nice!) or deactivate all features. 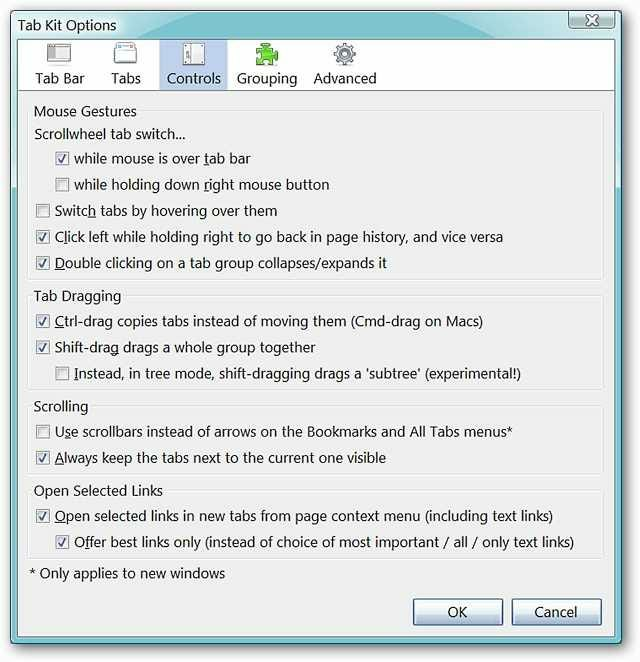 Here is a look at the Right Click Menu that is available when right clicking on a tab. More tab goodness! Whether you are looking for only one or two of Tab Kit’s features or all of them, this is one extension that will definitely put you in control of your browser’s tabs!